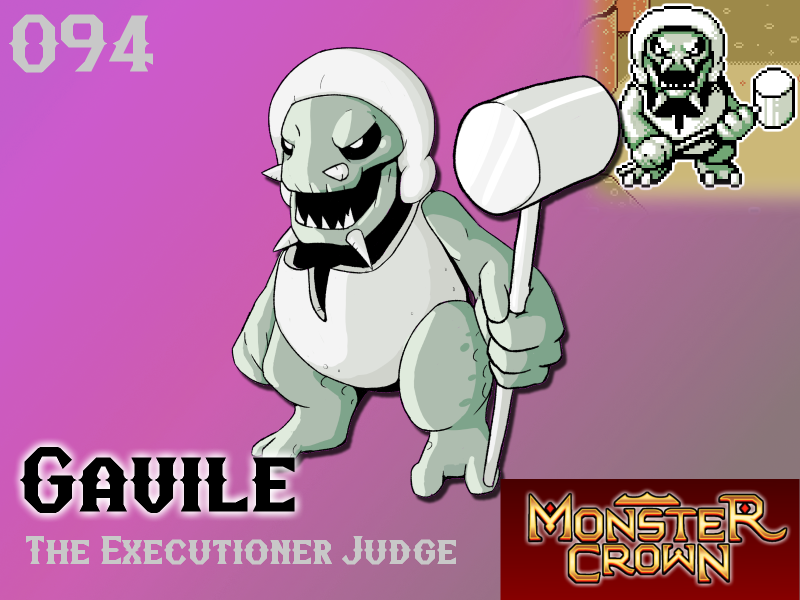 Wielding its most prized possession, a silver ore-metal hammer, Gavile lurks in dark chambers deep beneath the city where law was born. This monster uses a series of twisted and selfish rules to judge any being that crosses its path. If Gavile deems you unsavory it will begin to pursue - quietly, calmly and with severe prejudice. Favoring a decisive judgement and sentence, Gavile lacks empathy entirely. Forgiveness is not a concept it will allow or understand. For this reason Gavile makes a poor companion and has been known to enact justice on any tamer that does not fulfill their side of a pact. Will Gavile make your team? Oh cool! This one's definitely going on my team! I think I would only recruit this one just to see what happens if I fuse him with a Domigon.